On February 7, the Virginia State Police brought a crime scene to life for criminology professor Dan Murphy’s Crime Scene Investigation class. Murphy invited VSP Special Agents Clay Overholt and Brandon May ‘02 to his class to show students some of the technology behind crime scene investigation. They brought with them the Leica P50 Laser Scan Camera. It’s the newest version of this scanner and the VSP is the first law enforcement agency in Virginia to use it. These types of scanners were first used for architecture, designing, and building purposes. Brandon May ’02 sets up the Leica P50 Laser Scan Camera. 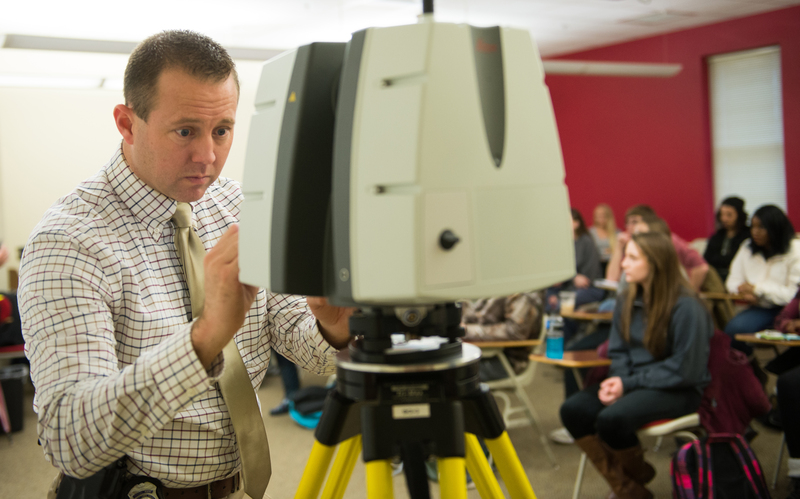 With the Leica P50, Overholt and May created a 3D model of the full classroom of students as if it were a crime scene. The Leica P50 was placed on a tripod and rotated 360 degrees to scan and take pictures of the room. May set up the scanner while Overholt explained how it worked and what it’s used for. The scanner can take a million measurements a second and takes about six minutes to scan 360 degrees. Overholt and May set the Leica P50 up at the front of the room and then moved it to the back to get a full scan of the classroom. 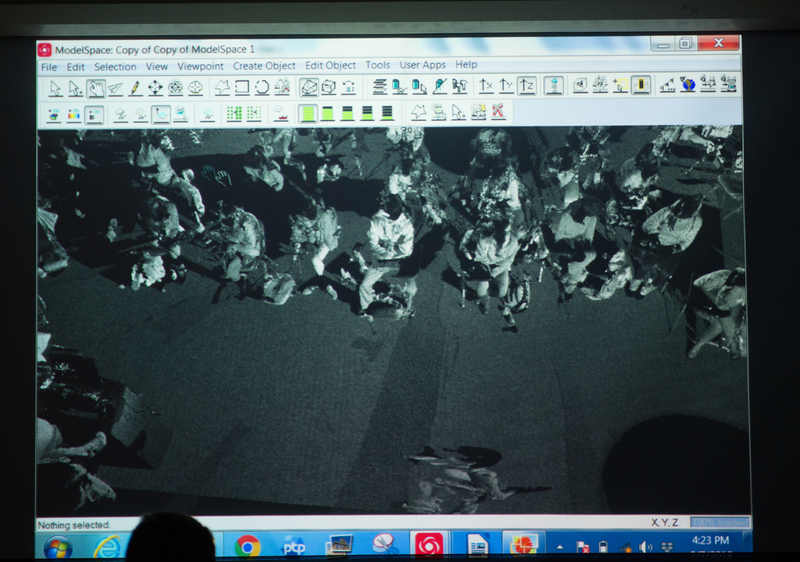 May then used a computer to overlap the two scans of the room and create a 3D image. Before revealing the image, May and Overholt described the difference between panoramic photography and the laser scans. The special agents showed the students that any measurement of the crime scene could be taken through the 3D images. “There is a rhythm to working a case, to an investigation and to a crime scene,” Overholt said before walking the class through several crime scene investigations to show examples of the capabilities of the laser scanner. The students were engaged and asked questions throughout the presentation. Toward the end of the class, Overholt and May gave professional advice to the students. They said the skills used in crime scene investigation factor into more careers than law enforcement and that it’s never too early to start a resume. Local TV station WSET also was on hand to watch the VSP’s presentation. You can see their coverage here.